La ampliación del Canal de Panamá sigue siendo el enfoque de estudios independientes de ingeniería. Sin duda alguna, con sencillos cambios al proyecto actual, el rendimiento futuro de esta enorme inversión puede ser incrementada importantemente con el uso más eficiente de técnicas conocidas y comprobadas. El artículo adjunto explica cómo sacarle más provecho al agua dulce de la cuenca para aumentar la capacidad de la vía y sus ingresos – sin crearles riesgos permanentes e innecesarios a los usuarios, a la población, al ambiente, ni a la cuenca y al canal en sí. Compartimos el entusiasmo con el que estos resultados han sido recibidas no sólo por expertos mundiales en canales y esclusas, pero por otros grupos técnicos, científicos y ambientales. En vista de las lecciones de Copenhagen, a Panamá le toca tomar las riendas del futuro – actuando con un liderazgo ejemplar, responsable y visionario – y mostrar que la voluntad colectiva sí existe para cambiar la forma en que se hacen inversiones de impacto permanente global. El Canal de Panamá debe ser el ejemplo. El mundo lo necesita. Delays can be very costly for large ships that use the Panama Canal. 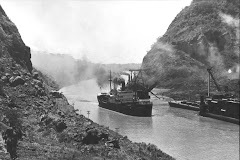 It has been suggested that, with the single-lane lock arrangement selected, the service to be offered by the expanded Panama Canal will be the most reliable and prompt. So, how much does that system reduce transit time relative to other systems, how does it improve reliability, and what are its down-sides? The logical way to operate that system is to have ships enter each end of the canal, in succession, the first part of the day; and, likewise, exit the other end of the canal during the latter part of the day. The transit direction of the single-lane locks would be reversed after the last entering ship sailed clear of them. Then the exiting process would begin for the ships waiting at lake-level, which by that time would have crossed the Isthmus of Panama. The last exiting ship sailing clear of the locks would mark the end of one day and the beginning of the next. This is similar to what is done in the present-day canal, although not for the same reason. Today's canal has a narrow section called "the cut", through which the largest ships that currently transit the canal -- Panamax ships -- can sail in one direction at a time and only during daylight hours. To optimize ship-flow through it, both lanes of the locks at each end of the canal begin the day by raising ships. As the Pacific locks are nearest the cut, northbound ships are the day's first to negotiate it. When southbound ships begin arriving at the cut, cut traffic management procedures are initiated, and that is followed by the reversal of one lane of the locks. As dusk approaches, the last of the large southbound ships hurry to get through the cut before dark. At about the same time the second lane at the locks is reversed to maximize the rate at which the ships exit the canal. During the remainder of the night, two-way lock operations are resumed to handle the smaller ship traffic that can ply the cut at night. Since the width of the cut will not be increased sufficiently in this canal expansion effort to permit Panamax ships -- or the larger post-Panamax ships that are to transit the new locks -- to meet each other in the cut, these larger ships will still have to take turns sailing through it. Because ships will need to wait for the transit direction of the cut, as well as that of the planned single-lane lock, to match theirs, a transit (from entry of the locks at one end of the canal to exit at the other) will most likely take about 15 hours, assuming all else goes smoothly. In theory, it could take a ship about two-thirds of that time, but operational reality is different. A simpler, proven two-lane alternative lock arrangement could be built for about the same cost. With only two-steps, it would handle up to 22 ships a day, compared to the single-lane system's maximum of about 14. A transit by way of these locks would take about 17.5 hours. When comparing these lock options, there is more to consider than just the differences in transit time and capacity of each system. As a starter, the two-lane lock arrangement requires about 13.5% less water per transit than the one planned. It also uses about 13.5% less water than what the canal's original locks use. Because of this, it would be logical to reduce the use of the original locks and use that water more effectively in the new locks to operate them at full capacity. The two-lane alternative locks need about 19 transit-volumes of original lock water to transit 22 ships. As there are presumably 12 transit volumes already available (per the single-lane lock plan), only 7 more need to be "borrowed" from the original locks. Because idle time is gained when transits through the original locks are reduced, that time can be applied towards reducing the amount of water used by those transits that do occur. As a result, total transits through these locks only need to be reduced by about 4 to gain the needed water. With this alternative of comparable cost, the canal capacity gained would be about 1.6 times that gained by using the planned system. This means that for every three ships that transit the two-lane alternative locks only two ships could transit the single-lane system. This suggest that, to recover the income from the ship that does not transit, the ships that do transit would be charged about 50% more in tolls. For the third ship that does not get to transit, is its "loss of time" not relevant? Then there is the matter of system reliability and safety. Because the planned system only has one lane, all large ship traffic would halt were it to close unexpectedly. How are costs to shipping impacted when that happens? With the two-lane alternative, on the other hand, ships could continue to transit through the unimpaired lane. The single-lane system requires a dam to be built across known fault lines. What is the cost of losing Gatun Lake should one of those faults slip and cause the dam to fail? And, how can reducing 12 daily transit times by 2.5 hours be reconciled against lost lives and a multi-year canal shut-down should that dam fail? The two-lane lock arrangement avoids the need for such a dam. Environmental and ecological issues must also not be overlooked. The planned single-lane arrangement promises to increase lake salinity at a rate that is markedly higher than that of today's canal. Many reputable studies have shown this. Not only will what is planned pollute a world-important freshwater lake with salt, that pollution will put many sea creatures along the coast of both oceans in harms way. How can reducing the canal transit time of a few select ships by 2.5 hours justify placing seafood delicacies enjoyed by millions on the endangered list? That is unacceptable and need not happen. To make matters worse, a follow-up expansion plan exists that adds more unnecessary problems. That plan will cost far more than the current one. It will terminate the way of life of a great many people and devastate the ecology of vast areas in order to obtain the water it needs to increase the post-Panamax ship transit capacity to about 30. By contrast, at lower cost and within the confines of today's watershed, the canal's post-Panamax transit capacity could be increased to 40 by adding a second two-lane lock arrangement like the first and by enhancing both to save even more water. The enhancement would consist of adding two water-saving tanks at each step of each two-lane arrangement, costing only about 15% more. 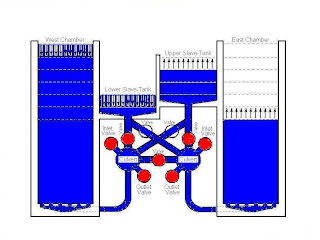 Water to operate both enhanced two-lane lock arrangements would be borrowed from the original locks by further optimizing their use of water and time as was described earlier. The option to expand the canal's watershed by expropriating lands and flooding vast areas would be reserved for when climate changes force it at some future date. Using the alternative locks in both expansions would result in about 27% more added capacity at a far lower cost, with far less impact to the ecology and to third parties, and a greatly reduced risk of total loss, compared to what is planned. 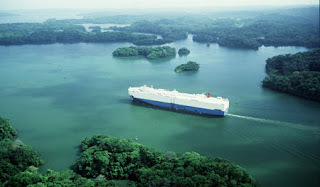 Today, the Panama Canal serves around 36 ships a day. Despite certain canal features being seen as causing "unnecessary" delays -- per a lack of understanding of the purpose of those features -- ships continue to show up and wait their turn to transit. Most of its users find transiting the Panama Canal a much better deal than any other option; and, more would use it if they could. Given that preference, and because once the planned single-lane system is built there is no way to later convert it into one that is more efficient and less polluting -- nor can the risk of losing the lake be removed, nor can any loss of ocean species be undone -- replacing that design is imperative. A two-lane lock arrangement offers a truly sustainable expansion: providing more service for the same cost, allowing for greater future growth, and avoiding catastrophic problems. That is what needs to be added to the Panama Canal. "Grupo Unidos por el Canal"
Los nefastos antecedentes sobre los que se funda la ampliación del Canal de Panamá no dejan de representar un enorme peligro para la Nación panameña. Las señales, pruebas y evidencias de la tropelía con la que se impuso el proyecto de ampliación son abundantes. El sólo análisis de lo que se trató de imponer con la nefasta Ley 44, echada abajo fundamentalmente por la lucha del campesinado organizado, revelaría nefastas ambiciones de poderosos clanes económicos que venden ilusiones con el proyecto de ampliación del Canal, mientras ellos, se enriquecen a la velocidad de cohete. Alberto Alemán Zubieta, renunció a la presidencia de Constructora Urbana S.A. (CUSA), un negocio familiar que ha pasado a ser, muy probablemente, la compañía constructora más importante en el país, una vez que fue nombrado como administrador del Canal de Panamá. CUSA ganó la primera licitación (para la remoción de tierras) en el proyecto de ampliación del Canal. Anteriormente la misma compañía había ganado otras licitaciones para obras de mantenimiento del mismo Canal. En los medios se ha reportado que, el “Grupo Unidos por el Canal construirá el nuevo juego de esclusas por 3,118,880,001.00 millones de dólares”. ¡Que casualidad!, ¡que sorpresa!, CUSA, Constructora Urbana S.A. forma parte del recién nacido “grupo unidos por el Canal”. Según se informa la ACP le ha otorgado, en un “TRASNPARENTE” proceso de licitación, el más prístino, limpio, pulcro, glorioso, inmaculado que se haya dado en toda la historia de la humanidad y antes de ella, la licitación para la construcción de el nuevo juego de esclusas. ¡Que vaina! Ahora el mismo y más interesado afirma que nada tiene que ver que el actual Administrador de la Autoridad del Canal (ACP), Alberto Alemán Zubieta, con Constructora Urbana S.A. (CUSA). Debemos entender -dejando cualquier sospecha de intereses cruzados o de conflicto de intereses a un lado- que no tiene nada de malo, ni representa falta a la ley o a la ética, pasar, de ser Presidente de una compañía familiar de construcción (CUSA), a ser el Administrador del Canal (ACP). Para que quede claro –eso sí, según la opinión de la persona más interesada y directamente involucrada en el tema-, que la compañía en cuestión, (CUSA), gane muchas y la más importante licitación en el multimillonario proyecto de ampliación del Canal, “no debería causar ninguna suspicacia”. El mismo administrador lo ha explicado a La Estrella de Panamá, en una noticia publicada el 9 de julio de 2009: “Para el administrador de la ACP, Alberto Alemán Zubieta, no debería causar ninguna suspicacia el hecho de haber sido accionista de CUSA y que su primo, Rogelio Alemán, sea el actual presidente de esa empresa. Al concluir el acto de apertura de sobres, Alemán Zubieta señaló que se retiró de CUSA hace 14 años cuando asumió su cargo en la ACP y que en 2005 vendió las acciones que le quedaban. ¿Se imaginan ustedes al administrador de la Autoridad del Canal de Panamá, al mismo tiempo, como presidente de una compañía constructora, que además empieza a descollar en el mercado nacional ganando licitaciones en las que se destacan trabajos para el Canal de Panamá? Nosotros no lo imaginamos, de allí que renunciar a la PRESIDENCIA DE CUSA al asumir la administración de la ACP era una jugada lógica seguida por la venta de “las acciones que le quedaban”. Una investigación a fondo es lo menos que debería hacer un gobierno responsable para develar los intereses y las ambiciones solapadas que están en el proyecto de ampliación del Canal. Los argumentos y las denuncias planteadas, desde antes de la imposición fraudulenta del proyecto, vienen a complementar los nuevos argumentos y justificadas SOSPECHAS que asoman la cara a pesar de la publicidad y la cuantiosa inversión en imagen que realiza la ACP. Eduardo A. Esquivel R. ing. Ya se han vertido muchos comentarios sobre la reciente “licitación” de la ampliación del Canal, llamada “el premio gordo de la ampliación”, por algunos medios. Leo con interés el artículo del Lic. Mora Rangel en la “Página del Lector”( La Prensa , 28/8/2009), donde expresa que “le asaltan nuevas preocupaciones” sobre esta adjudicación. Le diré que, desde el año pasado, cuando se supo que CUSA, la empresa de la familia Alemán, participaba en la licitación, a través de una empresa formada ad hoc para este negocio, llamada “Grupo Unidos por el Canal”, aposté a mis colegas que esta empresa sería la ganadora sin ninguna duda. Por supuesto: ¡Nadie me aceptó la apuesta! Era la crónica anticipada de una licitación ganada. Hemos visto que la ACP se ha preocupado mucho, antes y después de la licitación, en “explicar” la transparencia de la licitación, en espacios pagados en los medios. La propia insistencia en esta “explicación” pública es sospechosa, ya que si todos e hizo con honestidad y transparencia no hay nada que explicar. Pero, humildemente creo que la transparencia de esta licitación no es más que un hábil truco de ilusionista de salón. Hay indicios alarmantes en este sentido. Uno de ellos, quizás el más importante del proceso, es la participación de las otras empresas rivales de Unidos por el Canal. Una vez, un empresario conocido mío, supo de una licitación pública importante. Lo primero que hizo fue ponerse de acuerdo con el funcionario clave que manejaba el asunto para que se seleccionaran otras dos empresas específicas para la licitación final. Segundo, se puso de acuerdo con estas empresas rivales, para que participaran de “relleno” en la licitación, pero ofreciendo un precio ligeramente mayor. A cambio les dio una compensación monetaria importante. Veo con asombro que la ACP va a pagar, graciosamente, a las empresas que participaron de la licitación y perdieron, cerca de 15 millones de dólares. Si la ACP consideró que el proyecto presentado por estas empresas no le servía ¿Por qué les va a pagar por algo que no sirve? Otra cosa importante es, como dice el Lic. Mora Rangel. “Licitar lo más bajo posible, para poder emparejar las cargas durante la ejecución del proyecto, sería ni más ni menos una vulgar estafa”. De hecho: ¿Para qué se hace la licitación si después vienen las famosas adendas? Es importante que el Estado panameño, y la ACP , exija que no se dará ninguna clase de adendas ni compensaciones aparte de la suma original pactada. Sobre las empresas miembros de “Unidos por el Canal”, bueno, tienen un currículo espeluznante: una debe 16 mil millones de dólares en España; otra, en Estados Unidos, licitó un proyecto por 5 mil millones y terminó costando 15 mil millones con las adendas. La otra nunca ha construido nada parecido. Recordemos que el Canal de Panamá no pertenece a la ACP , sino al Estado panameño. Y es el Estado panameño el aval de todos los financiamientos que se hagan, y todos nosotros seremos los que pagaremos si este proyecto se maneja mal. En dos ocasiones anteriores, por este mismo diario, me he referido al tema del Canal. De ambos escritos “Sigámosle la pista al Canal” y “Procuremos el consenso”, el último me mereció la llamada y felicitación de un distinguido miembro de la familia Fidanque. A raíz del artículo “ La ACP debe ser más precavida”, del Ing. Carlos Rangel ( La Prensa , 22/8/2009), me asaltan nuevas preocupaciones. Si bien no me asustan las voces que hablan de conflictos de intereses, sí me pone a temblar las posibilidades de que este magno y necesario proyecto se convierta en el dolor de cabeza para las presentes y futuras generaciones de panameños. La situación financiera de las empresas líderes del consorcio ganador, aunado a las debilidades técnicas que han señalado algunos de los concursantes luego de concluidos los actos, debe poner al más osado de todos los mortales con la carne de gallina. Las aseveraciones del Ing. Alemán, de que al primer semestre de este año Sacyr y Vallehermoso han reportado 600 millones de utilidad y han comenzado a saldar su deuda de 16 mil millones de dólares con la venta de activos, por el nivel de sus compromisos y el tipo de empresa, no me tranquilizan para nada. Recomiendo al Gobierno en general, y a la ACP , en particular, que este tema sea analizado y coordinado por un equipo interdisciplinario del más alto nivel que incluya entre otros a la SPIA , a los colegios de abogados y economistas, técnicos y especialistas jubilados del Canal, etc. La ampliación del Canal es la obra de la cual dependerá el país para los próximos años y la responsabilidad por la situación que hoy se afronta no puede recaer en el sentimiento y en el olfato de un determinado funcionario. Los que sin ser ingenieros, por cierto tiempo hemos estado ligado a proyectos de esta disciplina, sabemos que operan como anteproyectos de ley, llevados al Legislativo. Sabemos cómo entran, pero no podemos asegurar cómo terminan, aparte de los consabidos “camarones”. Es necesario que se sepa de antemano cuál sería el límite máximo al que se puede extender el contrato suscrito y por qué tipo de consideraciones. Hay un riesgo que debe ser asumido por la ACP y otro por el consorcio ganador. Licitar lo más bajo posible, para esperar emparejar las cargas durante la ejecución del proyecto, sería ni más ni menos una vulgar estafa. En Panamá tenemos ejemplos de este tipo. En el Proyecto de Laguna Alta se licitó la compra de un volumen dado de agua y en el proceso de suscripción del contrato se aumentó dicho volumen, con lo cual, por economía de escala, le disminuyó el costo de producción al ganador, afectando al resto de los participantes. Todos, absolutamente todos, debemos apoyar a que la ACP conduzca a buen puerto el proyecto de ampliación del Canal. It is said that expanding the canal will benefit everyone. The Panama Canal’s cargo capacity is to be nearly doubled by the planned expansion, which is to add a single new lane for transiting Post-Panamax ships. Increasing the canal’s capacity has been long desired and seen as good, so it is difficult to argue against its expansion. However, is the chosen single-lane system really the best option and in the best interest of shippers and of society, who will ultimately fund the project? An independent review of water-saving and operational techniques has identified better lock systems that have been around for more than 100 years, as well as more recent ones that would be far more beneficial and cost-effective. As an example, an alternative single-lane system arrangement that has locks like those currently planned – but with 4 chambers (instead of 6) and 2 tanks per chamber (instead of 3¬) – would use 45 (instead of 52) million gallons per transit. Not only would this system have fewer parts and use less water per transit, a dike over geologic faults would be unnecessary and Gatún Lake would be spared from becoming brackish. However, with any single-lane system, an unexpected problem at any chamber can shut it down. To avoid shutdowns, a two-lane alternative with 8 chambers – and no tanks – that also uses 45 million gallons per transit could replace the currently planned system. 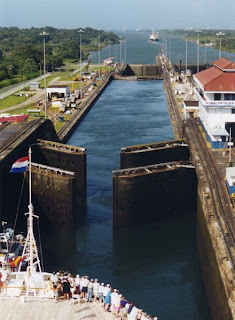 The Panama Canal’s Pedro-Miguel Lock unit is an example of that system’s type of locks. Water use could be further reduced to 30 million gallons per transit by using a recent improvement that adds 2 tanks to each unit of that system. As with the single-lane alternative, both two-lane systems would avoid the problematic dike presently planned, and Gatún Lake would be protected from salt intrusion. Either of these two-lane arrangements would make it possible to markedly increase canal cargo capacity, which means more growth in future business. The planned single-lane lock system presents no similarly obvious advantages. It offers relatively fewer transits for the water used, despite having many more components. Benefits from the alternatives found during the review, on the other hand, are clear. The single-lane alternative initially studied – which could transit at least 9, possibly 10, ships a day – has 2/3rds the chambers, fewer than half the tanks, and uses 13% less water per transit than the planned system. At first glance, the simpler single-lane locks would appear to be more cost-effective than those planned, when considering the transits obtained for the money spent on locks. However, even though more efficient, the lower total capacity of these simpler locks would likely not generate sufficient profit margin to pay for the expansion’s total investment. Thus, in addition to targeting higher efficiency, the new locks also need to be able to handle more transits. The two-step two-lane system noted above – which also uses about 13% less water per transit – could easily transit more than the 12 ships a day now planned. Assessment of it confirmed that it would be more cost-effective to build than the planned three-step single-lane system with 6 chamber and 18 tanks. Because of its two lanes, its chambers can perform the dual function of transiting ships and saving water. Increasing the number of chambers from 6 to 8 implies that this lock system will cost at least 1/3rd more than the planned system. However, that implied increase in cost is significantly reduced by the elimination of 18 tanks. Additional money is saved by not having to build a very risky dam across geologic faults, as is now required. That not only reduces the cost differential, it also removes risk. Because each transit uses less water, 14 ships can transit it instead of 12 a day with the same water. That increase in capacity pays for any remaining cost differential. Furthermore, even more transit capacity can be extracted from it. When heavy rains are more frequent, transits can be increased to about 18 a day. That increase could be made permanent later by adding water storage to the canal. Alternatively, transits could be increased by at least 50% simply by adding 2 tanks to each of the system’s two-lane lock units. With those tanks added, and when used most effectively, this two-lane system would reduce water-use to 57% of what the planned system will use per transit. In contrast, there is no way to modify the planned system to reduce its water-use in the future, short of demolishing them and building anew. Although a two-lane lock system could be designed and built so that tanks could be added in the future, if they were added at the outset they would immediately pay for themselves. Adding tanks would virtually eliminate the plan to seasonally fluctuate the level of Gatún Lake over a greater range than it is fluctuated today, a change that is needed to increase the supply of water for operating the planned locks. Eliminating that need would significantly reduce costly dredging. The 40ft draft depth of the canal’s 35 miles of channel between the Atlantic and Pacific locks must be increased to accommodate 50ft draft ships. However, by not having to drop the lake to the low level the planned system requires, those 35 miles would not have to be deepened an additional 4ft. Money spent on dredging those 4 extra feet to attain 12 transits a day would be better spent on tanks to attain 18 transits per day – which should also lower the tolls. Unless eliminated, the plan to increase lake fluctuations will also seasonally force ships that transit the original locks to reduce the cargo they carry by a much larger amount than is the case today, because the bottoms of the original lock chambers cannot be lowered as the lake level drops. The research shows that the two-lane system would permit canal service and reliability to be significantly improved at a cost about equal to what is currently planned. By spending the money more effectively, a lower risk and less problematic expansion can be accomplished, offering lower tolls, many more transits, and effectively eliminating the risk of a protracted wait for Post-Panamax ships due to an unexpected lane closure. None of the alternative systems call for a risky new dike across known faults as the planned new lane requires for traffic to bypass Miraflores Lake. The integrity of that planned dike cannot be guaranteed. Its failure would empty Gatún Lake. That puts the Panama Canal and Panama City at risk. It is a risk that can be totally avoided. Society, shippers, and operators of Pacific port facilities would be foolish to accept risking an unnecessary dam failure. Finally, there are additional impacts not accounted for in the present plan that do not arise with the alternative systems. The planned locks are to operate transiting ships in groups, one direction at a time. Brackish water will be injected into Gatún Lake when ocean-bound ships exit by way of these. This happens today, but only at Gatún Locks. (At the Pacific end of the canal, Miraflores Lake interrupts that salt-injection process.) The excess water in today's canal system falls just short of flushing all the salt reaching Gatún Lake. Consequently, its salt content has been rising very slowly over the last 100 years. Relative to today’s Gatún Locks, about triple the volume of brackish water will be injected into Gatún Lake when ships exit each end of the canal through the planned locks. Because the planned locks will use less fresh water per transit – 40% of what a regular lock operation uses – the mix of water in them will contain much more salt than what is injected today via Gatún Locks. As more lake water is used to move ships and less is spilled along with the salt it carries, Gatún Lake’s salt concentration will – without question – rise at a much faster rate than it is rising today. Obviously, adding salt to the lake does not negatively affect transits. But the Gatún Lake freshwater resource, which belongs to the nation, will be ruined when its salt concentration rises. That loss – avoidable if higher-yield locks are used – has not been taken into account in the costing of the planned single-lane design. Neither have losses from the predicted eradication of, or irreparable damage to, sea life along both coasts. Too much salt in the lake will permit coastal creatures to migrate across the Isthmus of Panama, which could lead to disastrous consequences, such as stronger species wiping out weaker ones. If the cost of these damages to nature were to be properly assessed for the expansion as it is now planned, its price tag would rise far above the most costly of any of the alternative lock options noted here, all of which use existing, tried-and-tested equipment and operations, and which more effectively control salt intrusion. Yet, the current plan continues. The perception is forming among many that the intent may be to deliberately damage Gatún Lake. Whether that is the case or not, a brackish Gatún Lake will create a huge market for those who have recently acquired rights to the water of many of Panama’s rivers. Those special interests will profit handsomely from selling their water to the population. Also – with Panama’s greatest freshwater reserve ruined – other special interests that have long wanted to install industries within the canal will be able to do so, without being blamed for polluting that invaluable global resource. It is clear that building the planned lock system brings no added benefits to society. The damage it will cause in order to benefit third parties is irreparable and unconscionable. Once poorly performing locks are built they cannot be modified later to improve their performance and reduce their negative effects. Several more effective lock alternatives to those misleadingly promoted as the best and only for the project exist. An unbiased revision of the plan – before lock construction begins – is imperative to guarantee a truly sustainable development project that optimizes canal services and maximizes capacity and profits, while preserving a critical freshwater reserve for this and future generations. Panama has been the focus of a far-reaching, global campaign to solidify it as a great place for investing, a great place for living and a great place to retire. The campaign has been so successful that it is difficult to navigate around the country without running in to newcomers at practically any and every stop. Usually debating what and where in the country to buy, it is always clear that it has never crossed their minds that the infrastructure propping up what they are placing their hard-earned cash into is anything other than what they’ve been sold. It has, therefore, come as an immense shock to many that their paradise is plagued with many problems, particularly those caused by certain of its custodians who have irrationally ignored every possible control and planning mechanism to the detriment of all of Panama’s inhabitants. For newcomers, besides problems with finalizing deals or even the details of an apartment, there is life-threatening pollution from all manner of uncontrolled contaminants presenting them an immediate, hidden and exponentially growing danger. Odd health ailments have arisen in areas receiving concentrated doses of fumes, often odorless, blown through their neighborhoods from nearby factories that do not use any form of filtering during their production cycles. To acid rain and intensifying smog, dioxins and other plastic-manufacturing chemicals are increasingly added daily. In general, the plastic portion of already unmanageable garbage presents the most worrying aspect. Whether in the cities and towns or in the countryside, or while driving along practically roadway, most people are breathing unhealthy levels of plastic fumes drifting from the ubiquitous – albeit illegal – garbage disposal fires that appear where least expected. Less visible are the hidden toxic waste disposal areas which have sprung up, given loopholes in the present laws, and which burn electronic waste – after scavenging through it – subsequently allowing rains to wash the residues, filtering heavy metals into nearby streams and into the water supply, as an example. With water quality controls not updated to include testing for much more than bacteria, these pollutants remain undetected. Besides air and water quality, the most urgent concern centers around water availability. Many neighborhoods in Panama City and around the country suffer from sporadically available supplies at best. Some have been receiving water via cistern trucks for years. In the meantime, illegal mining operations aided and abetted by some government officials are springing up across the country. Similarly, under the guise of hydroelectric projects, most freshwater sources have been concessioned off to third parties with irresponsibly lopsided contracts in their favor. It doesn’t take a giant step to see the water problems newcomers will face in paradise along with everyone else once supplies dry up or are destroyed by uncontrolled chemical use in the mining operations or other toxic dumping. In light of these activities, growing fears are now centering around the unnecessary risks the Panama Canal expansion presents to the country’s largest freshwater reserve, Gatún Lake. If its destruction is allowed, the only alternative for fresh water will be buying it from the concessionaires. That is, if it has not been polluted, too. 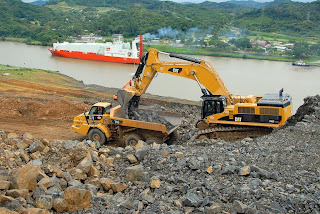 Whether there is a deliberate plan to destroy life-sustaining resources in order to create markets for private sale or whether it is due to continued gross incompetence by its custodians, neither the Panama Canal expansion, nor the mining projects and other poisoning activities can be allowed to continue unchecked. Those worrying about their investments in paradise need to join forces and take active steps to protect not only their investment, but their health as well. Increasing the canal’s capacity has been long desired and seen as good, so it is difficult to argue against its expansion. However, is the chosen single-lane system really the best and in the best interest of shippers and of society? An independent review of water-saving and operational techniques identified better lock systems that have been around for more than 100 years, and more recent designs that are even better. As an example, an alternative single-lane system that has locks like those currently planned – but these with 4 chambers (instead of 6) and 2 tanks per chamber (instead of 3¬) – would use 45 (instead of 52) million gallons per transit. This system would not only use fewer parts and less water, it would not need a dike over geologic faults, plus it would spare Gatún Lake from becoming brackish. However, an unexpected problem at any chamber can shut down a single-lane system. To avoid shutdowns, a two-lane system with 8 chambers – and no tanks – that also uses 45 million gallons per transit could replace the currently planned system. The Panama Canal’s Pedro-Miguel Lock unit is an example of that system’s type of locks. Water use could be further reduced to 30 million gallons per transit by using a recent design improvement that adds 2 tanks to each unit of that system. In either two-lane case, a dike across faults would be avoided and Gatún Lake would be protected from salt intrusion. These arrangements would result in increased canal cargo capacity, which means more growth in future business. What, then, are the benefits gained by society and the shipping community from building a single-lane lock system that has many more components than needed – which do not improve efficiency or service, but do increase risks and costs – instead of opting for a more effective system? …None! For special interests, however, there are many benefits… all to be paid for by society! The building of 50% more chambers and 125% more tanks than actually needed represents a very healthy increase in profit to the lock builder. Both components are very large and expensive, and require costly culverts and valves to interconnect them. Plus, every added element adds maintenance – i.e. higher future operational expenses charged back to the customer. Furthermore, a dike between Gatún Lake and Miraflores Lake – that could rupture should a fault slip – will be very expensive to build and cannot be guaranteed. Thus, what is now planned puts both the canal and inhabited areas – like Panama City – at risk. Society would be foolish to accept that risk, when it is completely avoidable. Finally, given that the planned locks are to be operated with ships transiting in groups, one direction at a time, brackish water will be injected into Gatún Lake as ocean-bound ships exit the locks. This happens today, but only at Gatún Locks. (At the Pacific end, Miraflores Lake interrupts that salt-injection process.) Today’s canal system falls just short of fully mitigating the salt that intrudes. Relative to today’s Gatún Locks, about three times more brackish water will be injected into Gatún Lake by each ship exiting the planned locks at each end of the canal. Then, because the planned locks will use less fresh water to operate (40% of the lake-water regular lock operations use), the water in them will contain much more salt than what is in the water injected today via Gatún Locks. Given that today’s salt mitigating capacity will be reduced as more water is diverted to lock operations, Gatún Lake’s salt concentration will -- without question -- rise at a much faster rate than that of today. Salt intrusion does not negatively affect transits. But, the publicly owned freshwater resource will be ruined as the lake’s salt concentration rises. And, it is predicted that the eradication of, or irreparable damage to, sea life along both coasts will follow. For the special interests that recently have acquired rights to many of Panama’s rivers, damaging the lake will create a huge market for their water. Also – with Panama’s greatest freshwater resource ruined – other special interests that have long wanted to install industries within the canal can do so, without being blamed for damaging that invaluable reserve. Therefore, this expansion will be very lucrative for certain special interests at the expense of everyone else.